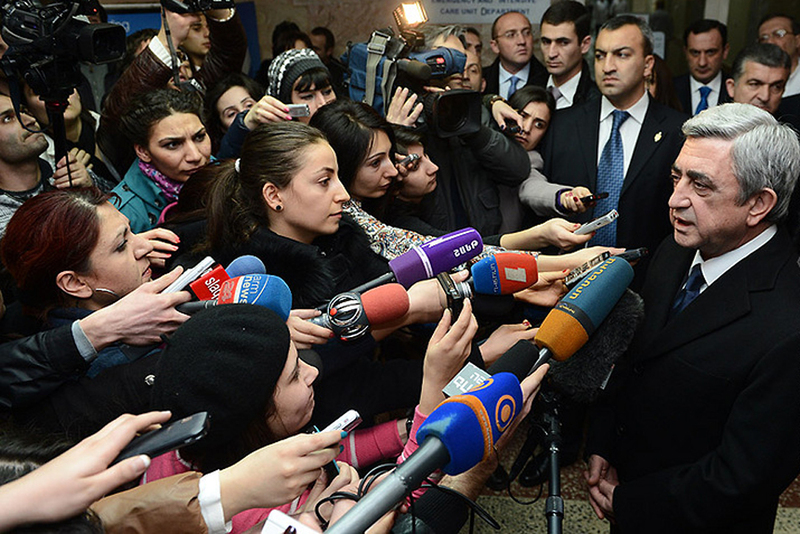 With the official outcome of Armenia’s February 18 vote widely seen as a given, attention within the country is instead focusing on the election process itself. The favorite, incumbent President Serzh Sargsyan, 58, faces six competitors, although his closest contender, the American-born Raffi Hovhannisian, the 53-year-old head of the tiny opposition Heritage Party and a onetime Armenian foreign minister, has been trailing the president by some 40-percentage points in recent opinion polls. The final struggle between the two men, though, could come down more to alleged election violations, than to percentages of the vote won. Hovhannisian’s campaign already has compiled and distributed a long list of grievances about alleged vote-tampering by local officials, a body made up overwhelmingly of members from Sargsyan’s Republican Party of Armenia. In comments to RFE/RL, President Sargsyan said that whether or not the vote had been fair would only be known “ after the election results have been summarized." Preliminary results will be released by the evening of February 19, with final results coming a week later. Yet, based on initial reports from Armenian media and watchdog organizations, some bad habits from elections past appear to be dying hard. “The election violations are just the same as during the previous poll” in 2008, said political analyst Armen Badalian. “The violations have become less significant in terms of visibility, since the number of participants has decreased, “ Badalian continued. The country’s largest opposition force, the Armenian National Congress, decided against running a candidate, and another opposition group, the Armenian Revolutionary Federation, has called on supporters to destroy their ballots. A powerful party sitting astride the political fence, Prosperous Armenia, also opted to sit the vote out. The ability to erase passport stamps from polling stations that indicated the bearer had voted was among the chief complaints from the field. The Central Election Commission argued that the stamps could not be removed, but videos of the procedure posted by online news outlets suggested otherwise. Other familiar claims -- alleged ballot-box stuffing, voter bribes, voter transportation, and voter “coaching” -- were all there, too. As were reports of alleged retribution against those highlighting problems. After Gala TV, a pro-opposition regional television station published a report that buses allegedly belonging to oligarch Samvel Aleksanian, a parliamentarian from the Republican Party, had been supposedly used for carousel-voting, the station’s website crashed from a DDoS attack. In its last pre-election report, observers from the Organization for Security and Cooperation in Europe’s Office for Democratic Institutes and Human Rights had flagged reported abuse of administrative resources as another concern. In a January video interview with RFE/RL, however, President Sargsyan downplayed the notion that local officials are misbehaving by taking an active role in the campaign. “And why shouldn’t they use their leadership – I mean, their prestige – for their political party or for ensuring the victory of their party’s leader?” he asked. The government, he asserted, has created “a competitive environment” for the vote. For a country awash in unemployment and corruption, struggling with an ongoing exodus of workers, the fear of fresh war with one of its neighbors, Azerbaijan, and failed attempts at peace with a second, Turkey, the reasons to vote could appear many. But with a campaign more about personalities than policies – a few candidates themselves even opposed the vote as “fraudulent” -- many voters believed they had few meaningful choices. “I haven’t seen such elections before. People have no hope at all. They don’t even know why they’ve come here,” one 30-something male voter at a downtown Yerevan polling station commented. Some voters preferred to spoil their ballots by voting for Armenian-American celebrity socialite Kim Kardashian or Soviet cartoon character Cheburashka or simply writing down quotes from Sargsyan’s various campaign rallies. Another voter decided to eat his ballot as a sign of protest. Officials nonetheless reported a substantial voter turnout, albeit not one indicative of energetic enthusiasm. When the polls closed at 8pm, the Central Election Commission reported voter turnout at 60.05-percent of Armenia’s registered 1,518,407 voters; about 10-percentage points less than in 2008. In 2008, thousands of people united around the opposition movement led by former President Levon Ter-Petrosian, but the fatal clashes between police and protesters that left ten people dead following the vote dampened the campaign enthusiasm of many. But few see those goals as meaning much in the way of real change for Armenia. “Tomorrow will be just the same as yesterday,” disparagingly commented Manvel Sarkisian, director of the Yerevan-based Armenian Center for National and International Studies. Marianna Grigoryan is a freelance reporter based in Yerevan and the editor of MediaLab.am.